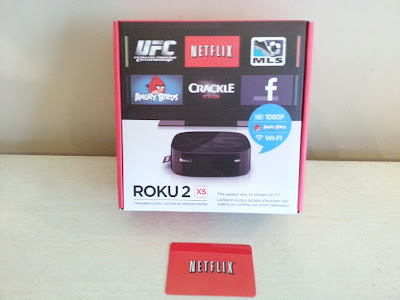 WIN a Roku 2 & 6 Months of Free Netflix! 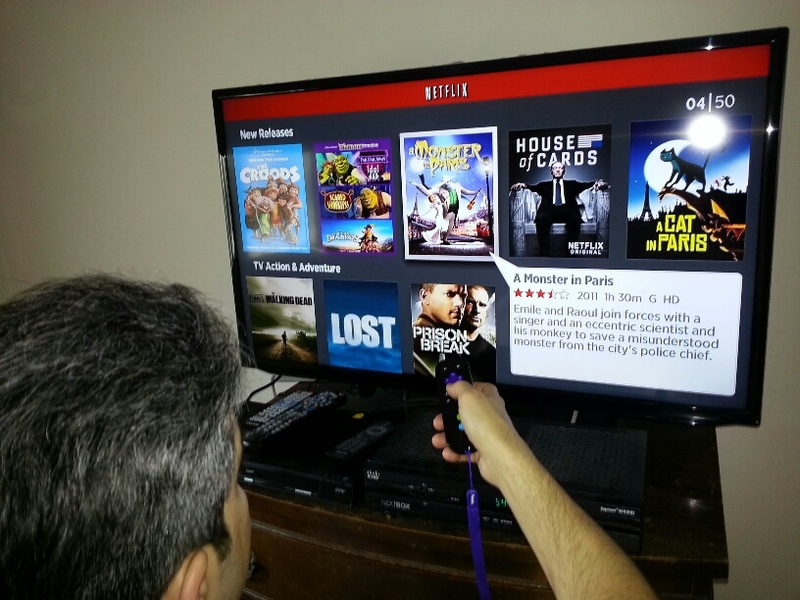 I had heard about Netflix for years before I took the plunge and set it up for my family. The truth was I was not sure how it worked, and the idea of watching television and shows exclusively on my computer or phone did not appeal to me. There's a kind of magic about watching a great movie in the comfort of my own home, on a nice flat screen tv! One evening while I was going through our extensive dvd library, I got a brainwave that it would be nice to have digital copies that did not take up storage space in my home. I went to the Netflix website, but I could not find the detailed information that I sought. It was clear that you could watch Netflix on the tv via XBox 360, PS3 or Wii, but I did not own any of these devices. You can also watch on some HDTVs, but I was betting there was some catch, and it would not work on my tv. As I thought back on my favourite tv shows, I reflected how many were either retired or outright cancelled: Desperate Housewives, LOST, The 4400, Flash Forward and others. My family pays over $85 for our television subscription, but we watch at most 1 hour of television per week. That's a lot of money for something we don't regularly use. I took a leap of faith and thought I would try the Netflix service, feeling there was nothing to lose. They offer a free trial of the first month, and it says you can cancel online at anytime if you don't like it. And I did like that the cost of this service was $7.99 per month. I decided to get a Roku 2 to make the tv viewing experience as similar to cable, with which I was already accustomed. When I say that it took me minutes to set up Netflix, I'm not kidding. First, I created a Netflix account on my computer. Even if you sign up with a free trial offer, you do need to provide PayPal or credit card information in case you decide to keep the service. Then I set up a Roku account on my computer, which was also simple. You choose the options that will appear on your television, if viewing that way. Then I connected my Roku internet streaming box via HDMI to my HDTV, and it worked instantly. I was stunned, as I had anticipated problems and delays. I selected a movie to watch and in about 2 seconds it was playing, no exaggeration. There was no long delays waiting for the film to load, like the internet. I also found the quality of the picture to be very similar to watching regular tv, although there was very occasional pixelling or blurring. The sound was excellent. 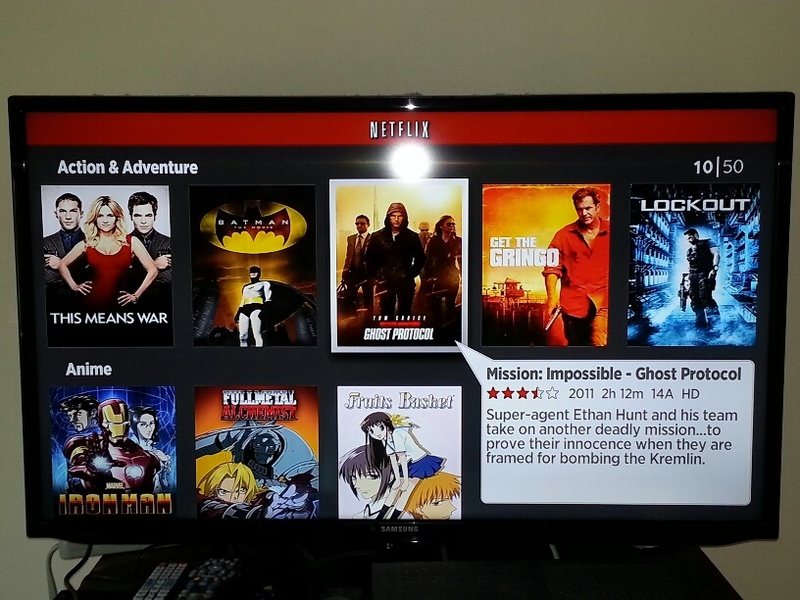 I flipped through the Netflix Canada menu and saw that there were many recent and classic movies and shows to watch. My husband was thrilled, and we started watching Netflix almost nightly! Some of the movies I've watched on Netflix so far have included The Hunger Games, X-Men: First Class, In Time and The Road. My husband has watched wrestling and some documentaries so far. My family has been very pleased with the service, and I would say my husband is doubly so. Netflix Canada has a good-sized movie and show library, which I hope they continue building with more new releases and popular titles. The kid's shows on Netflix are great! My children watch about 1 hour of movies every night or so, and Netflix has a great selection. They watched The Spy Next Door with Jackie Chan, Chipwrecked, Diary of a Wimpy Kid: Rodrick Rules, a Thomas the Train movie, and also started watching the 4th season of Sponge Bob Square Pants. Instead of asking if they can watch a movie that night, they now ask if they can watch Netflix. My family has really been enjoying Netflix so far, and we plan to continue on with the service! WIN a Roku 2 streaming box, Roku remote control AND and 6-months of FREE Netflix! Contest open to Canada & USA. Ends Monday May 20th, 2013. I would love to watch old episodes of Grey's Anatomy. 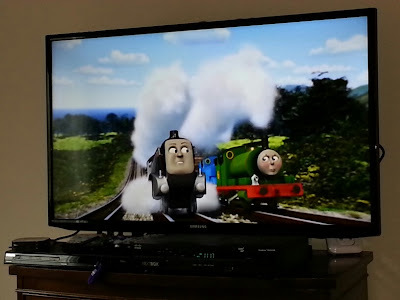 My daughter loves Dora and Thomas the Train so she would love to watch those types of shows :) Thanks for the great giveaway! Loving watching that! Never saw an episode before so find it crazy how they predicted so much. I would love to watch episodes of 24!! I would love to watch the new Hemlock Grove that premiered today on Netflix. There are many TV shows that I have fallen behind in and Netflix would be the best way to catch up without waiting for the series to come out on DVD. Waiting for Friends and The Perks of being a Wallflower. I would love to re-watch all the Boston Legal I can... love that show and miss it being on tv. I won elsewhere, please remove or discount my entries. Thank you and Good luck to the other entrants. Congratulations Freda! I'm thrilled for you! I know you'll love the prize! Please stay in touch and let me know how you enjoy Boston Legal! Love the movies as I don't get out to the cinemas. Currently I am watching the 4400 and rewatching Fringe. My 15 year old is watching Xfiles for the first time, and my little ones was Dora, Blues Clues etc, and power rangers. We watch movies too when we find ones of interest. i am current watching the walking dead. Great show. I'd dig watching Community, Breaking Bad and Drive over and over and over again. Community, Breaking Bad and Drive over and over and over again. I would really like to check out the new series Hemlock Grove, as well as the documentary Fat, Sick, and Nearly Dead (amongst others). Thank you. House of Cards would be what I would want to watch, it looks awesome. I want to see old episodes of friends. i want to watch Mad Men! I'd love to watch some Avatar. I'd like to watch Dexter and some good horror movies. I would watch breaking bad. So many great shows to see! I'd probably look up Frasier first. The Walking Dead and Arrested Development! The Walking Dead, The Tudors and lots of movies! I love watching Bones on Netflix! I'd love to watch the British Shows! I want to see House Of Cards. I'd like to watch The Walking Dead. I haven't seen a single episode yet. I'd love to watch Iron Man & Iron Man 2...before seeing the new Iron Man 3 at the theater! I'd like to start watching X-files from the start. dougo13, I'm sorry that the form isn't working correctly for you. 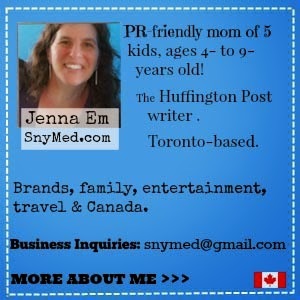 Please e-mail dan@promosimple.com with technical difficulties. Watching the older episodes of White Collar! I want to watch Firefly and Lost! My teen is excited to watch "old" cartoons (things I grew up with)! I would love to watch the walking dead,all my friends have been raving about it and I still have not even watched one episode yet!! I'd love to watch Freaks and Geeks, Undeclared, Twin Peaks, and Firefly -- shows I always wanted to see but never did. My family wants to watch "Life of Pi" soon! I'd love to watch the Diary of a Wimpy Kid movies with my son. I would like to watch "This Means War"
I would like to see all of the seasons of the Gilmore Girls. I like to watch korean dramas, while the kids happily watch Ninjago and My Little Pony. There are some special classic movies that I get a hankering to watch from time to time: "Moulin Rouge," "The Lion in Winter," "Midnight in Paris," the whole "Boston Legal" series. i love pretty little liars! i'd definitely watch that!! Would sure love to win this prize, would love to see some great movies! My son is a horror flick lover. I would like to watch all the episodes of Deadliest Catch that I have missed since we got rid of cable 3 years ago!! I'd like to watch all the Planet of the Apes movies. I would watch any Disney movies they have on Netflix with my grandchildren or Ramona and Beezus as they like those stories. House of Cards or Hemlock Grove! I would watch back to back episodes of Weeds. I would like to watch previous episodes of Dr Who. I'll watch arrested development over and over and over again! I am so far behind on all the movies that I would love to watch just about anything!! Thank you! I would watch the office . My son would love anything Thomas the Train, not that we don't already own 10-15 movies already. It's great hat your having this contest, I too am looking to replace expensive clbe that repeats the same thing constantly with something for economical for my family! I would like to watch the 4400 series and NCIS as well as family movies on netflix. I havw beem hestiant ot subscribe as I don't have a box like the Roku and aslo want ot watch it on ,y TV and not on our little netbook. Thank you for expaonong how it worked for you as I think now O could do it with a Roku box! I'd watch Game of Thrones, Breaking Bad, Doctor Who, and The Office. I would like to see LINCOLN! I'd like to watch Lincoln! I'd like to see some English tv shows. We always seem to get the U.S, versions way later.I want to see the originals. I'd love to watch some Breaking Bad! The Closer... I missed the last 2 seasons and I would REALLY love to see it to the end! I LOVE that show! Oh and I would love to catch up on Rizzoli and Isles. I think I would mostly watch TV shows, but would really like to catch up on recent movies. ZIt is just TOO expensive to go to a theater anymore!! GOSH!! I would LOVE to win!! We love the walking dead, but I wish the show Oz was on netflix too. We watch lots of kids shows at my house. I would love to see She Ra again. I wish netflix had HGTV shows. I love Netflix. Informative Article. Thanks for posting. I love Netflix! It has allowed us to watch tv in a whole new way!